The answer to the question why do plants need water may be obvious. Even grade school kids can provide a definitive answer. But there are underlying layers that can explain the importance of water for plants. Every living thing on our plant need water as one of the basic necessities to survive. It is also the means to grow and retain life. Without water, all organisms are surely going to struggle or worse die. If the human body is comprised of 70% water, plants must be composed of 95% water. Imagine yourself if you’re a plant and compare the amount of water to take every single day. It is that much. As a matter of fact, plants are the only living thing that needs water the most in order to continue growing and appearing in our surroundings. However, take note that some plants need more water while others can survive with less amount. This all depends on the type or species of the plant. But each and every plant relies on water. 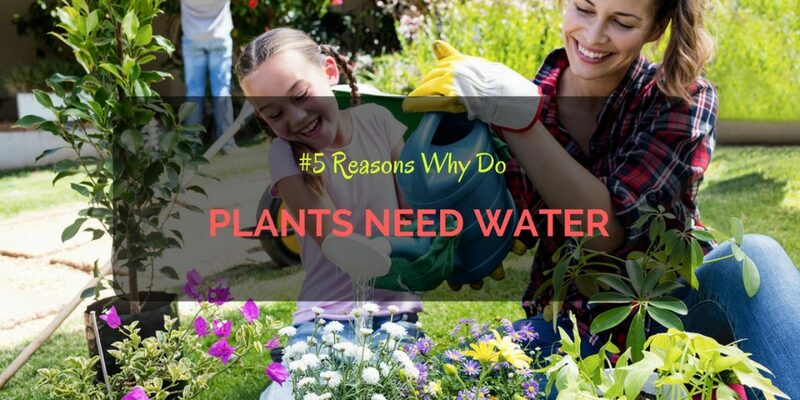 Primarily, there are 4 ways why do plants need water. But in this post, we’re going to point 5. Plants do not have internal or external skeletons, unlike in humans and animals. Both elements provide growth, support and strength. Except trees and shrubs, most plants depend on maintain strength and support through the pressure of water within their cells. There are different parts in each cell of plants. These include chloroplasts, mitochondria and less popular one called the vacuole, which is the largest. Vacuole is a room full of water that keeps the shape of the cell intact. Once water is enough, the plant becomes more versatile. It can endure atmospheric obstacles, such as the wind and swiftly falling rain from the clouds. Germination is the natural process of young plants to sprout or emerge from the seed. It’s also the period wherein a new tissue is formed and then followed by improved metabolism. In order to have a successful germination at the expected time, a suitable amount of water is required. It helps activate the enzymes that stimulate the whole process. To add that, water pressure aids in the breakage of the seed for easy and smooth sprouting. This also explains why do plants need water most at this stage. Photosynthesis is another process in the life of plants and an answer to why do plants need water. This is when the plants produce or refuel energy for growth and continued survival. This is more possible with the help of water. During this process, the sun initially provides energy and pass it on to and received by the plants to create energy through sugars. But sugar is completely formed with carbon dioxide and hydrogen. Both of these are taken from water. Water basically contains nutrients that supplement the growth and maintenance of plants. Once this liquid has been absorbed, so are the essential compounds. That’s why the amount of water must be sufficed. It is that important to ensure the necessary nourishment is provided. Transpiration is the process of passing water through plants, specifically from the roots, through the system called vascular to the atmosphere or air. It is similar to evaporation. You may be wondering why do plants need water through this. Firstly, it helps absorb carbon dioxide from air. It is necessary in cooling and hydrating the plants. Lastly, it enables water and its nutrients to flow. These are all the reasons why do plants need water. The second important question to answer is how to conserve water. There are plants that require watering once or twice a day. Others may just need a few times in a week. It depends on the type of plants. Hence, know the species of your plants to have an idea of how much watering you need to do. To avoid drying out water too quickly, it’s best to do it before 9 in the morning. Once the sun is in full sunshine, it can cause dryness fast that the plants may not absorbed enough nutrients. Everytime you water, use a good water system, hose or spray for smaller plants. If possible, just stick to water spray to have a better control on how much water is used. Always turn off the water when it is not needed. But take time to recheck and double check to avoid leaks. Many people may not want to do this but it can be helpful at times. You should catch some water when showering so you can use that in watering your plants.